"Great office. Highly recommended! My 4 children have seen two other dentist office and had a horrible experience! THANK YOU SO MUCH SMILEVILLE FOR MAKING MY CHILDREN COMFORTABLE!" "Great attention! Dr. Karen is very special with the kids and demonstrated that she cares about her patients. Excellent profesional! I went for my four year old daughter's appointment and I was so pleased that I left with my appointment and my husbands appointment as well!!!" "This is the best dentist office I have been to with my kids. My daughter is only 2 and on her fist visit to the office she was comfortable and did whatever the staff asked to her to do. This staff are friendly, knowledgeable, and caring. Love this place!" "I was really impressed with this dental practice! they are really friendly and Dr. Karen is wonderful! She was very clear in her explanation. another plus is that the clinic is all digital So you can view everything clearly! I would definitely recommend this practice! Thank you for genuinely treating me like a person and not another number, as other dental clinics!" "Highly satisfied. Very professional and friendly staff. Great for sending kids. What I liked was the kids experienced no pain when treated for cavities by Dr. Mejias. Best place in Wesley Chapel for dental care!" "Everyone in this office is friendly and professional. There is practically no wait and the staff make sure you know what is happening every step of the way. Thanks!" "We went to Smileville for my sons first visit today. The Staff was extremely nice and helpful and made my son feel comfortable. He even said that he can't wait to go back to the dentist, which he has never said before!! :)." "We had a great visit today. We were greeted with kindness and by all the staff. We had smiley faces and learned something new. Thank you for your services." "I love this dentist office because they offer us a great service, care, and a great feeling of satisfaction after the service. The staff members are very professional and make you feel at home, so you are comfortable and confident, instead of making you nervous prior to treatment. If there was a scale from 1-10 my rate would be 10/10﻿!" "Estoy supremamente satisfecho con el servicio y el profesionalismo del equipo medico de smileville ,una oficina dental familiar donde se combina la conveniencia, el buen trato y los precios justos." "I had a appointment with my daughter today. She's only 8 and they made her feel so comfortable and relax. She wasn't scared and Dr. Mejias explained everything to me. I was confused at first but she broke down everything for me and it was very helpful. I would definitely recommend this place to the other families and friends. Her staff is lovely!" "My 2 year old daughter, was very comfortable with the friendly staff. Will highly recommend this office to other friends and family." “Just had my teeth cleaned at Smileville Dental and it was a very nice experience. Everyone in the office is pleasant and they all have great smiles!" “I find the Smileville staff wonderful. They are very friendly, caring, and professional. My hygienist Jamie was fantastic and did a great job. Dr. Karen Meijas was super nice, and everyone made me feel very comfortable being there. I definitely recommend Smileville to friends and family will continue to come here!" “The entire staff has wonderful customer service, especially Rick at the front desk! He is friendly and always remembers me. I was very pleased with the work of my hygienist Jamie and the care provided by Dr. Karen Meijas. I highly recommend Smileville to my friends and family." “My previous dentist moved to another state, and I kept looking for another dentist whom I can be comfortable as a patient. Finally I chose Smileville and called for my first appointment with my husband and daughter. Our first experience was great. They had a wonderful staff and good customer service. They were very friendly and our next appointment was easily accommodated. Dr. K. Meijas is caring and very professional. Jamie the hygienist who took care of me was wonderful and did a great job. I would certainly recommend Smileville to my friends and family"
“I was interested in changing dentists, looking for something closer to home in the Wesley Chapel area and found Smileville; I'm so happy I made he switch and couldn't be happier with Dr. Mejias and her team. The office is newly renovated and is very conveniently located just behind the Sam's club in Seven Oaks. Dr. Mejias and her staff are very friendly, professional and accommodating. I had an emergency with with a cracked tooth and they were able to squeeze me in at fix the problem before it got out of hand. Unlike other dental offices, to date, they have been very timely on my appointments (no long waits). Dr Mejias does a great job of explaining work that needs to be done and takes the stress out of the decision making, best of all she is very gentle with her work. I never realized how different the whole dental experience could be. Happy to have found a great family owned practice that treats you like a person and not just another number. Highly recommended!" “The staff is wonderful, Dr. Mejias is awesome! I went in for an exam, and ended up having to have fillings done. Dr. Mejias was gentle, informative and all around knowledgeable. After my visit I made appointments for my husband and children, now our whole family are loyal patients. Thank you Smileville for taking care of our dental needs!" “Thanks for making my visit to your dental center THE BEST experience I have had in 40 years!!! At Smileville Family Dental Center everyone smiles. Dr. Mejias and her staff ROCK! Thanks again." “Dr. Mejias is very professional and pleasant. The hygienist is very thorough and the atmosphere is wonderful. Does not feel like you are going to the dentist, as Ricardo, the office manager always makes you feel right at home. Highly recommend!" 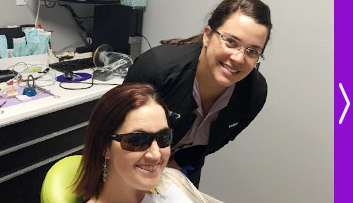 “My wife and I loved our recent visit with Dr. Mejias and her hygienist, April. We received outstanding care that was both thorough and gentle. We highly recommend her practice for all your general dentistry and look forward to continued excellent care." 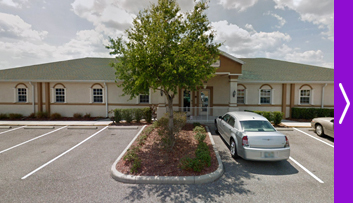 Our office is located in beautiful Wesley Chapel, Florida right across the street from the Wiregrass Mall. 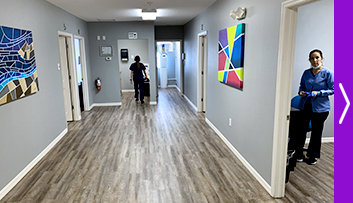 You are always welcome to stop by, see our practice and meet our Smileville team at: 26827 Foggy Creek Road, Suite 103, Wesley Chapel, FL 33544. Above all, we pride ourselves in patient education… We believe good oral health is critically important to your overall wellness. Maintaining good oral health is a step in the right direction towards an impressive smile, and may also result in a lifetime of overall wellness, free from problems. You will see an immediate difference in our dental practice the minute you visit our office. But more than that, it is our team of highly–trained and experienced staff members that make the difference in your results and total experience.